Operation Christmas Child brings joy and hope to children in desperate situations worldwide through gift-filled shoe boxes and the Good News of God’s love. Shoeboxes are packed with gifts of small toys, school supplies, hygiene items, t-shirts and sunglasses, etc. Every box is delivered with love AND with a gospel message! For more information, please visit the Operation Christmas Child official website. We are collecting year round for our packing party in 2019. Items with a * are needed most. All items should be new. We always need containers to pack items in. Not sure what toys to donate? One meaningful gift is a soccer ball and pump, an incredible gift to give because a child can share it with friend. Wet wipes are accepted however because wet wipes do not have enough liquid to spill out into the shoebox so they are OK to include in your gift. Starting in 2017, toothpaste cannot be included in shoebox gifts, but a child’s oral hygiene can still be improved by regular use of a toothbrush alone. Toothbrushes can only be accepted if they are in SEALED packing. 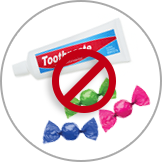 That means if you buy a five-pack of toothbrushes, please leave them packaged…one child will receive all five. But that’s ok - those toothbrushes may be all the entire family ever has. Please keep in mind the size of a shoebox when making purchases. NO liquids or candy of any kind including toothpaste. God has already chosen a child to receive your shoebox. Thank you. Buy an item each month to create a shoebox that will delight a child at Christmas. Here are some ideas for creating your own shoebox items.